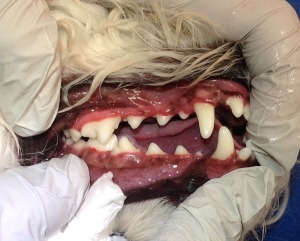 Do your dog's teeth look like this? Wouldyou rather have them look like this? Aaron Goulding of South Coast Pet Dentals and veterinarian Danielle Spade DVM travel to Under One Woof on the second Friday of every month and the following Saturday to provide anesthesia-free dental cleaning for all breeds of dogs and cats. Your pet will have sparkling clean teeth and better breath, too. 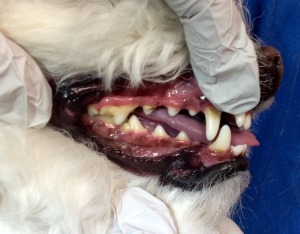 The procedure is safe, effective and in full compliance with the California Veterinary Medical Board requirement that pet dental cleaning be conducted under the supervision of a veterinarian. A full cleaning is $195. Follow-up maintenance is $105 each for quarterly cleanings. (Full price is charged for cleanings scheduled five or more months after the initial cleaning.) For more information, call Aaron at (858) 752-9778. Follow the link to the website and click the 'Book Appointment' tab up at the top header. This will allow you to customize your appointment! Please help us make dental appointments available for all the clients that need them by cancelling any appointments you cannot keep no fewer than 24 hours in advance. Clients who fail to keep or cancel dental appointments will need to make a $50 deposit to book future dental appointments; the deposit will apply toward the fee for the dental service or will be refunded if the appointment is cancelled no fewer than 24 hours in advance. We appreciate your cooperation. Please note that older dogs and cats may not be good candidates for this service. The stress of the procedure can take a lot out of a senior pet. South Coast Pet Dentals cannot accept liability for senior pets or pets with previous health conditions.